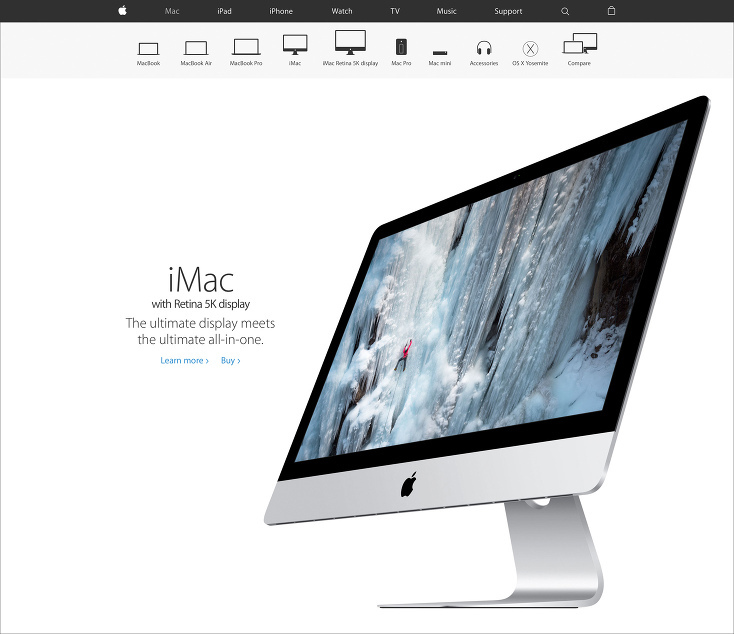 Last fall, when Apple announced the new Retina 5K iMacs they used one of my surfing images to promote the new machine. Just recently I started seeing the ice climbing image shown above being featured on the 5K iMacs. As always, it is an honor to work with Apple. They are one of the most prestigious companies anywhere on Earth and they drive trends in a way few companies can. In the image above, pro climber Dawn Glanc is ice climbing in the Ouray Ice Park in Ouray, Colorado. This image was created using powerful strobes to light up the ice climb and create something a bit different than your average ice climbing image. Earlier this year, I went back and worked with Dawn again to create a more dramatic set of images in the Ouray ICe Park using Hypersync lighting techniques. You can read about that shoot on the blog, on the Elinchrom website, or in my Spring 2015 Newsletter. My thanks to the team at Apple for using my images for the latest marketing campaigns and to Dawn Glanc for helping to create such a stunning image. Fred Facker - Enjoyed your workshop on Sunday. Did you see the new Leica SL that dropped today? It’s a Nikon killer! Michael Clark - Thanks Fred. Saw the new Leica this morning but at three times the price of a Nikon D750 I fail to see how that 24 MP camera will be a Nikon Killer…. Fred Facker - The D750 only does 6.5 frames per second. The SL does 11 fps and shoots 1080p up to 120fps (or 4k but not that fast). Of course, with only one lens available for the SL at launch, it may be a while before anyone switches systems.